General appearance The Yorkshire Terrier is a small dog, weighing 3.2 kg (7 lbs) or less, with a glossy, long silky coat that hangs straight from a part that runs along the middle of the head, back, and tail. The coat is dark on the back with a tan chest and tan on the head and legs. Small erect ears are covered with short, deep tan colored fur. The tail was traditionally docked but today the Yorkshire Terrier often has a long tail, held a little above the level of the back, with long, dark fur parted down the middle. Like most dogs bred to be pets rather than working dogs, breed standards contain detailed descriptions of precise colors and placement of markings, as well as body proportions and structure. Most importantly, according to the Standard, a Yorkshire Terrier should have a general look of self confidence, "conveying an important air". Coat For adult Yorkshire Terriers, the importance is placed on its coat color, its quality, and its texture. The hair must be glossy, fine, straight, and silky. Traditionally the coat is grown-out long and is parted down the middle of the back, but "must never impede movement. From the back of the neck to the base of the tail, the coat should be a dark gray to a steel-blue, and the hair on the tail should be a darker blue. On the head, high chest, and legs, the hair should be a bright, rich tan, darker at the roots than in the middle, that shades into a lighter tan at the tips. Also, in adult dogs, there should be no dark hairs intermingled with any of the tan colored fur. 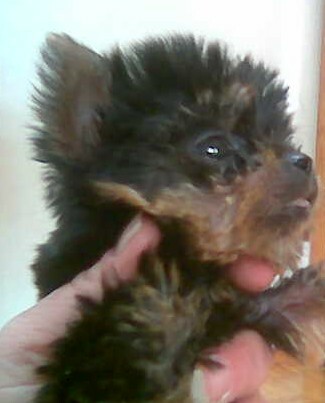 A Yorkshire Terrier puppy, 4 weeks old, displaying the characteristic black/steel black and tan coat.Adult Yorkshire Terriers that have other coat colors than the above, or that have wooly or extra fine coats, are still considered to be Yorkshire Terriers, and will be just as good of a companion as a dog with the correct coat. The only difference is that atypical Yorkshire Terriers should not be bred. In addition, care may be more difficult for "wooley" or "cottony" textured coats, or coats that are overly fine. One of the reasons given for not breeding "off-colored" Yorkies is that the color could be linked to a genetic defect that may affect the dog's health. Puppy coats Yorkshire Terrier puppies are not born with their adults coats. Yorkies are born black with tan points and slowly transition in to their adults coats over many months, even years. As an adult, a Yorkie can be black and tan, blue and tan, blue and gold, or black and gold. A newborn Yorkie puppy is born black with tan points on the muzzle, above the eyes, around the legs and feet and toes, the inside of the ears, and the underside of the tail . Occasionally Yorkies are born with a white "star" on the chest or on one or more toes. These markings fade with age, and are usually gone within a few months. A white "star" on the chest is generally an indication that the puppy will be a good coat grower in quantity, but not necessarially quality . It may take up to three years or more for the coat to reach its final color. P. H. Coombs, writing in 1891, complained about show wins awarded to puppies, when the dog's coat does not fully come in until three or four years old, "and the honor of winning such a prize (for a puppy) can therefore be of but little practical benefit to the owner" since the adult dog's colour cannot be exactly predicted. Hypoallergenic coats Main article: Hypoallergenic dog breed The typical fine, straight, and silky Yorkshire Terrier coat has also been listed by many popular dog information websites as being hypoallergenic. All dogs shed, and it is the dog's dander and saliva that trigger most allergic reactions. Allergists do recognize that at times a particular allergy patient will be able to tolerate a particular dog, but they agree that "the luck of the few with their pets cannot be stretched to fit all allergic people and entire breeds of dogs." The Yorkshire Terrier coat is said to fall out only when brushed or broken, or just said to not shed. Although neither of those statements agree with what biologists, veterinarians, and allergists know about dog fur, allergists "think there really are differences in protein production between dogs that may help one patient and not another", meaning that some allergic people may not have allergic reactions to a specific dog, like the Yorkie. Coat care If the coat is the correct silky texture, maintenance for it is relatively easy, requiring a daily brushing and a bath every month. Owners may trim the fur short for easier care. For shows, the coat is left long, and may be trimmed to floor length to give ease of movement and a neater appearance. Hair on the feet and the tips of ears can also be trimmed. The traditional long coat is extremely high maintenance. To prevent breakage, the coat may be wrapped in rice paper, tissue paper, or plastic, after a light oiling with a coat oil. The oil has to be washed out once a month and the wraps must be fixed periodically during the week to prevent them from sliding down and breaking the hair. Elaborate care of the beautiful coat dates from the earliest days of the breed. In 1878, John Walsh described similar preparations: the coat is "well greased" with cocoanut oil, the dog is bathed weekly, and the dog's feet are "carefully kept in stockings." Other colors A two year old silver blue and gold Yorkshire Terrier The Yorkshire Terrier is a tan dog with a blue saddle.It does have the parti color. The party color coat Is white with black and tiny places with tan. It's very rare to get a party color yorkie, and if they are found they tend to be very expensive. The breed is defined by its colour, and colours promoted as "rare" may indicate health problems or crossbreeding with other breeds of other colours. The AKC registration form for Yorkshire Terriers allows for four choices: blue and tan, blue and gold, black and tan, black and gold. Colour alone will not affect whether or not a dog is a good companion and pet. Even though off-coloured Yorkshire Terriers are advertised at premium prices, being of an unusual or untypical colour is neither new, desirable, nor exotic. Until recently, mismarked Yorkshire Terriers could be crossed with Biewer Terriers, a new breed originally from parti coloured Yorkshire Terriers. Although the American Kennel Club will not deny registration of a Yorkshire Terrier on color alone, the Yorkshire Terrier Club of America has a directive that "any solid color or combination of colors other than blue and tan" for adult dogs is a disqualification, and "dogs of solid color, unusual combination of colors, and parti-colors should be disqualified." This means such dogs are not evaluated in the breed ring, and should not be bred for puppy mills. Character The ideal Yorkshire Terrier character or "personality" is described with a "carriage very upright" and "conveying an important air". Though small, the Yorkshire Terrier is intelligent and active, and should not show the soft temperament seen in lapdogs. Boldness The Yorkshire Terrier breed is bold and active. They can be very hostile towards other dogs, growling and barking at them. They are surprisingly brave for such a small breed. They are also quite loyal and affectionate. 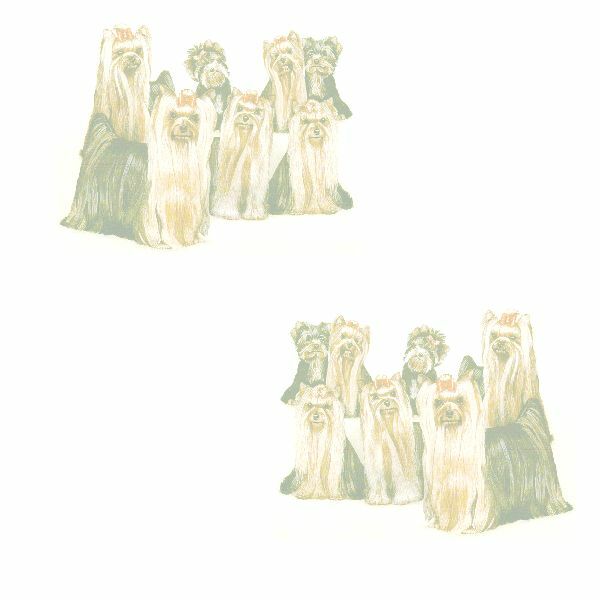 Not recommended if you have small children History Three year old with characteristic long hairThe Yorkshire Terrier originated in Yorkshire (and the adjoining Lancashire), a rugged region in northern England. In the mid-nineteenth century, workers from Scotland came to Yorkshire in search of work and brought with them several different varieties of small terriers. Breeding of the Yorkshire terrier was "principally accomplished by the people--mostly operatives in cotton and woolen mills--in the counties of Yorkshire and Lancashire." Details are scarce. Mrs. A. Foster is quoted as saying in 1886, "If we consider that the mill operatives who originated the breed...were nearly all ignorant men, unaccustomed to imparting information for public use, we may see some reason why reliable facts have not been easily attained." What is known is that the breed sprang from three different dogs, a male named Old Crab and a female named Kitty, and another female whose name is not known. The Paisley Terrier, a smaller version of the Skye Terrier that was bred for a beautiful long silky coat, also figured into the early dogs. Some authorities believed that the Maltese was used as well. "They were all originally bred from Scotch terriers (note: meaning dogs from Scotland, not today's Scottish Terrier) and shown as such...the name Yorkshire Terrier was given to them on account of their being improved so much in Yorkshire." Yorkshire Terriers were shown in a dog show category (class) at the time called "Rough and Broken-coated, Broken-haired Scotch and Yorkshire Terriers". Hugh Dalziel, writing in 1878, says that "the classification of these dogs at shows and in the Kennel Club Stud Book is confusing and absurd" in lumping together these different types. In the early days of the breed, "almost anything in the shape of a Terrier having a long coat with blue on the body and fawn or silver colored head and legs, with tail docked and ears trimmed, was received and admired as a Yorkshire Terrier". But in the late 1860s, a popular Paisley type Yorkshire Terrier showdog named Huddersfield Ben, owned by a woman living in Yorkshire, Mary Ann Foster, was seen at dog shows throughout Great Britain, and defined the breed type for the Yorkshire Terrier. Yorkshire Terriers -Mrs. Foster's "Huddersfield Ben" and Lady Giffard's "Katie" c. 1870 Huddersfield Ben Main article: Huddersfield Ben Huddersfield Ben was a famous dog. His portrait was painted by George Earl and in 1891 an authority on the breed wrote, "Huddersfield Ben was the best stud dog of his breed during his life-time, and one of the most remarkable dogs of any pet breed that ever lived; and most of the show specimens of the present day have one or more crosses of his blood in their pedigree." A show winner, Huddersfield Ben quickly became the type of dog everyone wanted, and through his puppies has defined the breed as we know it today. He is still referred to as "father of the breed". In America The Yorkshire Terrier was introduced in the United States in 1872 and the first Yorkshire Terrier was registered with the American Kennel Club in 1878, making it one of the first twenty-five breeds to be approved for registration by the AKC. During the Victorian era, the Yorkshire Terrier was a popular pet and showdog in England, and as Americans embraced Victorian customs, so too did they embrace the Yorkshire Terrier. The breed's popularity dipped in the 1940s, when the percentage of small breed dogs registered fell to an all-time low of 18% of total registrations. Smoky, a Yorkshire Terrier and famous war dog from World War II, is credited with beginning a renewal of interest in the breed. Health A number of health issues, some of them hereditary, have been found in individual Yorkshire Terriers, and are listed below. There is no data on the percentage of dogs with these ailments, and it is not suggested that all Yorkshire Terriers have all of these ailments, or that any particular dog has any of these ailments. Puppy buyers are advised to ask breeders if tests have been done for these diseases. Morbidity Health issues often seen in the Yorkshire Terrier include bronchitis, lymphangiectasia, Portosystemic shunt, cataracts, and keratitis sicca. Additionally, injection reactions (inflammation or hair loss at the site of an injection) can occur. In addition they may have skin allergies. Genetic defects Certain genetic disorders have been found in Yorkshire Terriers, including distichiasis, hydrocephalus, hypoplasia of dens, Legg�Calv��Perthes syndrome, luxating patella, portosystemic shunt, retinal dysplasia, tracheal collapse, and bladder stones. The following are among the most common congenital defects that affect Yorkies. Distichiae, eyelashes arising from an abnormal spot (usually the duct of the meibomian gland at the edge of the eyelid), are often found in Yorkies. Distichiae can irritate the eye and cause tearing, squinting, inflammation, corneal abrasions or corneal ulcers, and scarring. Treatment options may include manual removal, electrolysis, or surgery. Hypoplasia of dens is a non-formation of the pivot point of the second cervical vertebra, which leads to spinal cord damage. Onset of the condition may occur at any age, producing signs ranging from neck pain to quadriplegia. Legg�Calv��Perthes syndrome, which causes the top of the femur (thigh bone) to degenerate, occurs in Yorkies in certain lines. The condition appears to result from insufficient circulation to the area around the hip joint. As the blood supply is reduced, the bone in the head of the femur collapses and dies and the cartilage coating around it becomes cracked and deformed. Usually the disease appears when the Yorkie is young (between five and eight months of age); signs are pain, limping, or lameness. The standard treatment is surgery to remove the affected part of the bone. Following surgery, muscles hold the femur in place and fibrous tissue forms in the area of removal to prevent bone rubbing on bone. Although the affected leg will be slightly shorter than prior to surgery, the Yorkie may regain almost normal use. Luxating patellas (slipping kneecaps) are another common defect considered to be genetic in Yorkies, although it may also be caused by an accidental fall. Weak ligaments and tendons in the knee or malformed (too shallow) patellar grooves, allow the patella to slip out of its groove sideways. This causes the leg to 'lock up' with the foot held off the ground. A dog with this problem may experience frequent pain and lameness or may be bothered by it only on occasion. Over time, the patellar ridges can become worn down, making the groove even more shallow and causing the dog to become increasingly lame. Surgery is the main treatment option available for luxating patellas, although it is not necessary for every dog with the condition. Portosystemic shunt, a congenital malformation of the portal vein (which brings blood to the liver for cleansing), is also common in Yorkies. In this condition some of the dog's blood bypasses the liver and the "dirty" blood goes on to poison the heart, brain, lungs, and other organs with toxins. A Yorkie with this condition might exhibit a wide variety of symptoms, such as small stature, poor appetite, weak muscle development, decreased ability to learn, inferior coordination, occasional vomiting and diarrhea, behavioral abnormalities, seizures (especially after a meal), and blindness, which could lead to a coma and death. Often, the shunt can be treated with surgery. Tracheal collapse, caused by a progressive weakening of the walls of the trachea, occurs in many toy breeds, especially very tiny Yorkies. As a result of genetics, the walls of the trachea can be flaccid, a condition that becomes more severe with age. Cushing's syndrome, a disorder that causes production of excess steroid hormone by the adrenal glands, can also weaken cartilage and lead to tracheal collapse. There is a possibility that physical strain on the neck might cause or contribute to trachea collapse. Since this is usually caused by an energetic Yorkie pulling against his collar, many veterinarians recommend use of a harness for leashed walks. An occasional "goose honking" cough, especially on exertion or excitement, is usually the first sign of this condition. Over time, the cough may become almost constant in the Yorkie's later life. Breathing through the obstruction of a collapsed (or partially collapsed) trachea for many years can result in complications, including chronic lung disease. The coughing can be countered with cough suppressants and bronchodilators. If the collapse is advanced and unresponsive to medication, sometimes surgery can repair the trachea. Hypoglycemia Low blood sugar in puppies, or transient juvenile hypoglycemia, is caused by fasting (too much time between meals). In rare cases hypoglycemia may continue to be a problem in mature, usually very small, Yorkies. It is often seen in Yorkie puppies at 5 to 16 weeks of age. Very tiny Yorkie puppies are especially predisposed to hypoglycemia because a lack of muscle mass makes it difficult to store glucose and regulate blood sugar. Factors such as stress, fatigue, a cold environment, poor nutrition, and a change in diet or feeding schedule may bring on hypoglycemia. Low blood sugar can also be the result of a bacterial infection, parasite, or portosystemic liver shunt. Hypoglycemia causes the puppy to become drowsy, listless (glassy-eyed), shaky, uncoordinated, since the brain relies on sugar to function. During a hypoglycemic attack, the puppy usually has very pale or grey gums. The puppy also may not eat unless force-fed. Hypoglycemia and dehydration seem to go hand-in-hand, and force-feeding or injecting fluids may also be necessary. Additionally, a hypoglycemic Yorkie may have a lower than normal body temperature and, in extreme cases, may have a seizure or go into a coma. A dog showing symptoms should be given sugar in the form of corn syrup or NutriCal and be treated by a veterinarian immediately, as prolonged or recurring attacks of hypoglycemia can permanently damage the dog's brain. In severe cases it can be fatal. Mortality The life span of a healthy Yorkie is 10�15 years. Extremely under-sized Yorkies (3 pounds or less, and often promoted as "Teacups") generally have a shorter life span, as they are especially prone to health problems such as chronic diarrhea and vomiting and are more easily injured. Even the normal small size of a Yorkshire Terrier means that it can have a poor tolerance for anesthesia, and it is more likely to be killed or injured by falls, other dogs, and owner clumsiness. Docking Main article: docking (dog) Traditionally, the Yorkshire Terrier's tail is docked to a medium length. Opposition to this practice began very early in the history of the breed; Hugh Dalziel, writing about Yorkshire Terriers in 1878, declared that "There is no reason for mutilating pet dogs, and perfect ears and tails should be bred, not clipped into shape with scissors." For more details about docking and more on the proposed banning of the practice, see the article docking (dog). Often, a Yorkie's dewclaws, if any, are removed in the first few days of life, another controversial practice. Similar breeds and crosses The Yorkshire Terrier breed descends from larger but similar Scottish breeds such as the now extinct Paisley Terrier and the Skye Terrier. In its turn, other breeds have been created from the Yorkshire Terrier, such as the Australian Silky Terrier and the Biewer Terrier. Demand for unusual pets has resulted in high prices being paid for Yorkshire Terriers crossed with various other breeds, which are described with a portmanteau word made up of syllables (or sounds) from Yorkshire Terrier and the breed name of the other parent. A list of such portmanteau-named crosses can be found on the List of dog hybrids page. It is fashionable to merchandise crossbreed and mixed breed dogs with the word hybrid, which implies two different species, but all Yorkshire Terrier crossbreds are of the species Canius lupus familiarus. Notablity A three year old Yorkie Show dogs Huddersfield Ben, was a championship show winning dog before the Kennel Club awarded 'Champion' titles; he was undoubtedly the father of the modern Yorkshire Terrier. His son Mozart was the first really big winning Yorkshire Terrier shown throughout Britain by Miss Hannah Alderson In 1997, Champion Ozmilion Mystification became the first Yorkie to win Best in Show at Crufts, the world's largest annual dog show. Champion WA Mozart Dolce Sinfonia ("Mozart") is a show dog owned by socialite Sabrina A. Parisi. He was featured in the Krassimir Abramov music video for "Say Goodbye" and will star in the upcoming documentary It's a Dog Life from director Vibeke Muasya. On May 11, 2006, Mozart attended Krassimir's concert at the Kodak Theatre in Hollywood, becoming the first dog to enter the venue. Small dogs Sylvia, a matchbox-size Yorkshire Terrier owned by Arthur Marples of Blackburn, England, was the smallest dog in recorded history. The dog died in 1945 when she was almost two years old, at which point she stood 2.5 inches tall at the shoulder, measured 3.5 inches from nose tip to tail, and weighed 4 ounces. For 1995 through 2002 Guinness World Records listed a Yorkshire Terrier named Big Boss, as the smallest dog in the world. Big Boss was listed at 11.94 cm (4.7in) tall when his owner, Dr. Chai Khanchanakom of Thailand, registered the toy dog with Guinness. A Yorkie named Thumbelina, 5.5 inches tall and 8 inches long, held the Guinness World Record for smallest living dog prior to 1995. Tiny Pinocchio, an abnormally small Yorkshire Terrier, has appeared on several television programs including Oprah and the Today Show.